• The ransom note for Jon Benét Ramsey. • The anthrax letters threatening our government and media agencies. With the aid of forensic linguistics, the words criminals leave behind in their unsigned letters can be as distinctive as a signature or voice. Although the linguistic study of language is well established, this important analytical tool is something new for many jurors, judges, attorneys, and other forensic specialists dealing with both criminal and civil cases. Forensic Linguistics: Advances in Forensic Stylistics provides an introduction to the field for those who need to understand what linguist-witnesses do, and aids those experts who need to talk about what they do in non-technical terms. Stylistics is an identification method which seeks to match one piece of writing to another by analyzing such factors as spelling, text arrangement, abbreviations, word formation, characteristic words and phrases, and syntax. 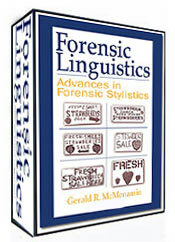 Forensic Linguistics: Advances in Forensic Stylistics documents current advances in this field, including quantitative methods of data analysis, a new way to provide scientific standardization, and new research directed at providing baseline data for determining the significance of style markers.